Federal Minister for Planning and Development Chaudhry Ahsan Iqbal has said that all routes of China-Pakistan Economic Corridor (CPEC) are being worked at simultaneously and that the western route will be the first to be operational. In a tweet, Ahsan Iqbal said that work is in progress on all the routes simultaneously. He also said that the official Memorandum of Understanding (MoU) on CPEC was signed on July 5, 2013. “If anyone can show after that any official record/map of alleged change of route from west to east I will resign”, he added. There have been rumors circulating over change in route of the CPEC and some of the political parties expressed reservations over them but the federal minister has put all the rumors to rest by clarifying that there are several routes and work is in progress on all of them. He also challenged that if anyone could bring any official record or map of change in routes, he would resign. Prime Minister Nawaz Sharif on Monday said the Peshawar, Karachi motorway under the China, Pakistan Economic Corridor (CPEC) project should be completed by 2017. “Work on different sections of the Peshawar, Karachi motorway should be completed by 2017,” the premier said, while chairing a meeting to review the progress of projects under the China, Pakistan Economic Corridor (CPEC) project. During the meeting, PM Nawaz directed authorities to expedite work on the projects under the CPEC to materialise the dream of a prosperous Pakistan. “Energy projects under CPEC should be completed on fast-track,” the premier said. “Railway stations from Peshawar to Karachi should be upgraded and maximum facilities should be provided to the passengers,” he added. PM Nawaz also upheld that the Gwadar International Airport should be completed in the shortest possible time. Earlier this week, Army chief General Raheel Sharif visited Panjgur area of Balochistan and vowed to torpedo the campaign run by the country’s enemies against the CPEC and help get the project off the ground. Emphasising the importance of the CPEC, the army chief said construction of these roads would link Gwadar port with the rest of the country at Chaman and the Indus Highway. 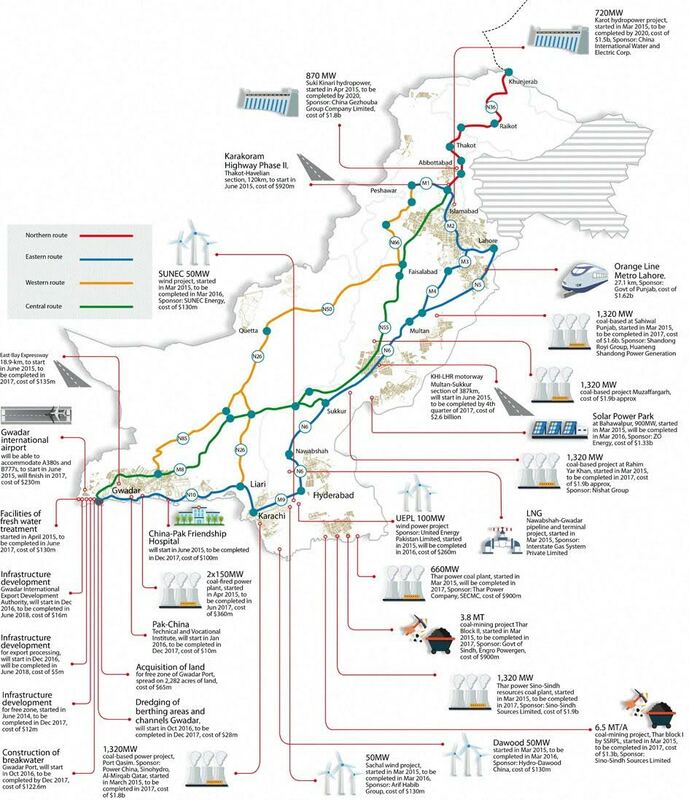 A wind farm in Pakistan built with China's help is generating more than a million kilowatt-hours of electricity every day as the Communist nation has stepped up funding of solar, hydro and nuclear power projects under the USD 46 billion China-Pakistan Economic Corridor. The wind power project built by China's Three Gorges Corporation operates for more than 20 hours a day, and since it went into operation in November, the facility has generated around 93 million kilowatt-hours, a spokes .. The Quaid-e-Azam Solar Park is a 229-hectare facility in the Cholistan desert, and has been hailed as an early part of China's Silk Road program. According to China Daily, 100-megawatts of capacity have been installed in just three months, at a cost of $215 million. The investment is part of the China-Pakistan Economic Corridor (CPEC), a $46 billion scheme planned by Chinese President Xi Jinping, according to The Nation. Very good news. For textile industry my main expense is electricity so can you tell me if the rate will come down. We pay about 10 rupees per unit which is higher than in the past now. I heard they will charge 13 rupees because that is higher than if I use generator. Junaid: " I heard they will charge 13 rupees because that is higher than if I use generator. " Renewables (solar, wind) generally cost more and governments everywhere subsidize them to incentivize producers while keeping cost charged to customers relatively low. The reorientation of Pakistan’s national security policies remains little noticed because media coverage of Pakistan is crisis-driven and narrowly focused, often overlooking longer-term trends. Pakistan is still routinely chastised for inadequately demobilizing militant groups, overspending on its military (both conventional and nuclear forces) relative to its social needs, and trading accusations with India without initiatives to improve relations. NEW DELHI: The International Monetary Fund has retained its forecast for India's growth even as it marginally lowered the global growth target for the year in its latest update of the world economy. Indian economy is forecast to grow 7.5% in 2015, the IMF said in its update of the World Economic Outlook, retaining its April forecast. Pakistan local car assemblers have started the new fiscal year with a positive growth of around 129 percent year on year (YoY), according to the data released by Pakistan Automotive Manufacturers Association (PAMA). During July 2015, the local vehicle sales including LCVs, Vans and Jeeps stood at 15,909 units. It is important to note that in July 2014, sales dropped abnormally due to increase in advance motor vehicle tax and imposition of advance income tax on transfer of motor vehicles in Federal Budget FY15, said Muhammad Tahir Saeed, an analyst at Topline Research. “Furthermore, anticipated new ‘Corolla’ model and less working hours due to Ramadan were other factors contributing to the historical low sales in last July,” he added. Overall healthy growth in auto sector is indicative of increase in per capita income, improved farmer economics and overall recovery of the economy. Car financing is also picking up gradually, currently estimated at 30 percent versus 5.0 percent few years ago. To recall, car sales in Pakistan grew at a 5-year (FY11-15) CAGR of 5.3 percent to 179,953 units while volumes surged by 31 percent in FY15 on the back of a new model of Toyota Corolla, Taxi Scheme of Punjab government and an increase in car financing due to 42-year low interest rates in the country. “We forecast car sales to grow at 13 percent in FY16 to reach at 203,653 units,” the analyst added. Among individual companies, Pak Suzuki Motors (PSMC) sales increased by 119 percent YoY to 9,464 units in Jul 2015 primarily due to Punjab government’s Taxi Scheme. Volumes declined by three percent on Month-on-Month (MoM) basis due to extended Eid holidays. Indus Motors Company (IMC) sold around 4,259 units in Jul 2015 compared to 1,106 units in the same month last year. It is pertinent to note that customers were waiting for the new model of Toyota Corolla in the same month last year which was the main reason for such an abnormally low base. On MoM basis, INDU sales decreased by 22 percent from 5,458 units it sold in Jun 2015. Saeed attributed this decline to less working hours during Ramadan and extended Eid holidays. Just to highlight, Toyota’s new Corolla model is sold out for next 3-4 months, according to the sources in the industry. HCAR sold 2,181 units in Jul 2015 compared to 1,505 units in the same month last year. On MoM basis, HCAR sales decreased by 12 percent in Jul 2015 from 2,488 units in Jun 2015. It is important to note that HCAR is consistently posting sales growth despite the new model of Toyota Corolla launched by its competitor Indus Motors. This indicates that overall market size of Pakistan automobile sector is growing. Millat Tractors (MTL) and Al Ghazi (AGTL) sales have been affected due to the floods. MTL sold 743 units in July 2015 compared to 1,703 units in the same month last year. On Month-on-Month basis, MTL sales decreased by 71 percent in July 2015 from 2,556 units in June 2015. AGTL sold 820 units in Jul 2015 compared to 1,056 units in the same month last year. On Month-on-Month basis, AGTL sales decreased by 40 percent in Jul 2015 from 1,375 units in Jun 2015. ISLAMABAD (Dunya News) -- Shanghai Electric Power signed an agreement with government regarding Thar coal power project on Friday. Federal Minster of Power and Energy Khawaja Asif said that the project worth 2 billion dollars with will bring 1320 Megawatt (Mw) which will be charged at an initial tariff of 8 rupee per unit, reported Dunya News. Talking at the occasion, Federal Minster of Power and Energy Khawaja Asif said that Thar coal power project is a vital part of China-Pakistan Economic Corridor (CPEC). The project, costing 2 billion dollars, will be completed in 2018. He said that project will bring 1320 Mw which will be charged an initial tariff of 8 rupee per unit. Federal Minster of Power and Energy said that LNG is being supplied to the power plants. The CPEC agreement goes far beyond a port, highway and power plants. Gwadar will be all but rebuilt with a hospital, new drinking water supply and an international airport. The agreement spans Chinese biotech for cotton farmers to a multi-million dollar fibre optic network to slots on Pakistani Television for Chinese shows. While the Karachi-to-Kashgar axis—Gwadar included—receives the most attention, it is only the easternmost of three corridors. Plans exist for central and western alignments—the latter running from Gwadar to Quetta and beyond. Beijing has made the eastern alignment priority, postponing the central alignment that many Pakistanis prefer. China cites the July 2013 memorandum which says construction would “take the easiest [route] first”. This has not gone down well with many provinces. Balochistan economic advisor, Kaiser Bengali, complained the present plan would not help economic activity in backward areas. Senator Taj Haider of the Pakistan People’s Party, noting wealthy Punjab would benefit the most, has promised his party would “protest” against “the choice of route” and “the placement of some of the projects”. Under pressure from the military, however, the provinces have grudgingly endorsed the corridor. Balochistan chief minister Abdul Malik Baloch, a strident critic, is among those who have backtracked recently. China has security concerns about the two other alignments, fed by Pakistani fears that India would somehow sabotage the corridor’s construction. Pakistani army chief, General Raheel Sharif, last month twice warned “enemies of the state” would try to stop the corridor. Islamabad plans to train 12,000 security personnel to protect the coming hordes of Chinese workers. This will be in addition to the 8,000 security personnel already deployed to guard existing Chinese workers. Chinese media has already fretted about its workers being abducted. Reports say Chinese and Pakistani intelligence are sharing information on the anti-corridor activities of “foreign hostile agencies”—a reference to India’s Research and Analysis Wing. Prime Minister Nawaz Sharif on Monday inaugurated the Pakistan-China Friendship Tunnels, which have been constructed by China over the Attabad Lake in Gilgit-Baltistan's Hunza valley. Nawaz said Gilgit-Baltistan is a vital link in the China Pakistan Economic Corridor and would benefit most from this mega project which would particularly increase the tourist influx. The seven kilometre long five tunnels are part of the 24km long portion of the Karakorum Highway (KKH) which was damaged in 2010 due to land sliding at Attabad. Chief of Army Staff (COAS) General Raheel Sharif on Wednesday inaugurated multiple project in Federally Administrated Tribal Areas (FATA) as part of post military operation rehabilitation plan. According to Director General Inter-Services Public Relations (ISPR) Major-General Asim Bajwa the army chief inaugurated Cadet College Wana, 132 KV grid station along 54 km long transmission line and a 62 km long road to connect Dera Ismail Khan (DI KHAN) and Tank during his day long visit to South Waziristan. Speaking on the occasion, General Raheel Sharif said the process of development will continue till complete rehabilitation of tribal region whose people sacrificed to cleans terrorism announcing that every promise made with Temporarily Displaced People (TDP) will be fulfilled. He said the operation Zarb-e-Azb was in final stages and soon the tribal people will be back in their homes and terrorists shall never return back. He also commended the locals for their sacrifices. General Raheel Sharif announced that Pakistan army will stay in the region till the mission is completed urging the people of FATA to actively take part in rehabilitation process by army to attain the fruits of military operation and prosperity. The statement further added these projects will not only improve the quality of life in the areas but also become a source of jobs for locals. The 62 km long Dera Ismail Khan-Tank Road is part of 705 km long Central Trade Corridor that will be linked to Afghanistan, he said. The president-designate of the Asian Infrastructure Investment Bank, Jin Liqun, showed interest in financing infrastructure projects in energy, transport, sea port and urban development areas in Pakistan. Jin, who is visiting Pakistan, met with Pakistani Prime Minister Nawaz Sharif and held talks with cabinet ministers on cooperation and the AIIB's investment. Sharif told Jin that his government has invested a lot of resources in energy and infrastructure projects with the help of China. Addressing a news conference along with Pakistani Finance Minister Ishaq Dar (Pictured, at right beside Jin Liqun) in Islamabad, Jin said Pakistan has great potential in the infrastructure sector. “The bank is looking forward for closer cooperation with the country's public and private sector," he said. Minister for Planning and Development Ahsan Iqbal has vowed to make China Pakistan Economic Coriodor Project a reality. Talking to the media persons in Islamabad on Tuesday, he said the western route of the CPEC will be completed before December next year which will generate economic activity in the region. He said the enemies of Balochistan’s development do not want completion of the western route of CPEC. He said the province will be put on the path of development by constructing Gwadar-Quetta link road. Ahsan Iqbal invited Pakistan Tehreek-e Insaaf to join the process of national development by rejecting negative politics. For Pakistan, the benefits of CPEC have already started showing. Similar to China, Pakistan’s relationship with United States is deteriorating. The country needs to prosper economically, making it less reliant on the United States. The economic corridor will provide Pakistan with the perfect opportunity to stabilize itself economically while cultivating ties with its neighbors. On the other hand, energy production being the current core concern of development authorities of Pakistan, is expected take a major leap forward. The Thar Coal Projects have been lined up as priority projects as part of CPEC, which in combination with two other harvest projects will be able to generate up to 2400 megawatts of power by the year 2018. An agreement for the Lahore Orange Line Metro Project was also concluded earlier this April. According to a web release by Norinco, a pioneer and leader of Chinese military trade, this multi-million dollar deal marks the first urban rail transit project in Pakistan under the “One Belt, One Road” Chinese framework. Apart from the obvious benefits to Pakistan’s power production, logistics, transportation, communication, and freight handling industries, CPEC will also immensely benefit the country’s real estate running along the trade corridor. While the real estate sector grows exponentially, Pakistan’s Minister of Commerce Khurram Dastagir Khan also offered the countries making up the Shanghai Cooperation Organisation (SCO) access to Pakistani ports to gain access to seaways from the Arabian Sea when the China-Pakistan Economic Corridor (CPEC) becomes functional. With all this development going on, the China-Pakistan-Iran trilateral in South Asia is looking up and huge affinities in inter-regional trade could be just around the corner. Iran’s decision to join CPEC would not only usher in an era of improved standard living across the Sistan-Balochistan region by facilitating trade between Islamabad, Beijing, and Tehran, but also provide a cost-effective gateway to the Gulf region for other Asian countries like Russia and even India. Russia agreed to build and possibly run a planned natural gas link in Pakistan as President Vladimir Putin seeks to bolster the country’s influence in the Middle East and Asia. The countries signed an intergovernmental agreement for a pipeline that would connect liquefied natural gas terminals in southern Pakistan and its energy-hungry north, with construction to be completed by late 2017, Pakistan’s Petroleum Ministry said in a statement Friday. The line will reach its project capacity by early 2020, Russia’s Energy Ministry said in a separate statement. A unit of Russia’s Rostec State Corp. will manage the project and invite foreign investors, including China, to participate. Putin is seeking allies in Asia and the Middle East in an effort to break out of international isolation caused by the Ukrainian crisis, while Russia’s military build up in Syria has contributed to tensions, especially with the U.S. The deal with Pakistan comes after more than a decade of talks about gas-pipeline projects. “Construction of the North-South pipeline brings trade and economic cooperation of Russia and Pakistan to a new level,” Russian Energy Minister Alexander Novak said in the statement. He and his Pakistani counterpart Shahid Khaqan Abbasi signed the accord in Islamabad in the presence of Prime Minister Nawaz Sharif, according to the statement. Russia is studying funding from Russian and Chinese development banks for the link, the ministry in Moscow said without elaborating. A project company, set up by potential investors, will own and run the 1,100 kilometer (684 mile) pipeline over 25 years, according to the statement. The link would ship as much as 12.4 billion cubic meters of gas per year, which is about 30 percent of Pakistan’s current consumption. Pakistan and the Asian Development Bank (ADB) on Thursday signed a loan agreement of $178 million for construction of the Gojra-Shorkot section of the M-4 Motorway, aimed at linking the southern parts of the country with the northern belt. The United Kingdom will also fund road construction and would provide $90.7 million as a grant. The UK will disburse funds through the ADB. The government will invest the counterpart share of $46 million, bringing the total cost of the project to $315 million. The M-4 Motorway will have four sections. The Faisalabad-Gojra’s 58-kilometre section has been opened for traffic. The project was completed by obtaining a loan of $170 million from the ADB. However, a dispute between the contractor and the NHA remains unresolved. The Gojra-Shorkot section of 62km will be completed by 2019. The rest of the sections are Shorkot-Din Pur-Khanewal (64km) and Khanewal-Multan (45km). Once the M-4 is completed, it will link the southern parts of Punjab with the north through already established networks of motorways. The M-4 Motorway will extend the already completed M-1, M-2 and M-3 motorways southward and shorten the distance between Multan and the twin cities of Islamabad-Rawalpindi. Upon completion, the M-4 Motorway will provide a four-lane access controlled alternative to the existing narrow and congested routes notably in the heavily trafficked Faisalabad and Khanewal-Multan-Muzffargrah areas. Economic Affairs Division (EAD) Secretary Saleem Sethi and the ADB Country Director Werner Liepach signed the loan agreement. It is the second project that is being co-financed by the UK government. Britain is already a participant of the China-Pakistan Economic Corridor and provided $121.6 million in grant to fund construction of the Burhan-Havelian Expressway, which falls on the northern route. The ADB said the new investment will boost the flow of trade and travel while reducing transportation cost and time from Pakistan’s textile producing hub Faisalabad towards Multan, which is the major trade centre in southern Punjab. The ADB and UK’s Department for International Development (DFID) have joined hands to assist Pakistan in improving the country’s vital north-south road network to promote economic growth, job creation and regional connectivity, according to an official handout issued by the local office of the Manila-based lending agency. Acting head of the UK’s DFID Judith Herberston said UK’s partnership with ADB and the government of Pakistan will help improve road safety and enhance local and regional trade. The M-4 is also a step towards positioning Pakistan to act as a transit artery for goods moving between the port city of Karachi in the south to Torkham on the northern border with Afghanistan through the country’s major business and population centres. The 1,800-km route will also eventually link Pakistan’s ports with the land-locked regions of Central Asia, and will allow Pakistan to reap dividends of its active membership in the Central Asia Regional Economic Cooperation (CAREC) Programme, said the ADB. The EAD secretary thanked ADB and DIFD for providing vital support to Pakistan, particularly for efficiency gain from road traffic operation along the National Transport Corridor. He assured Pakistan’s commitment to mobilise all-out efforts and scale up practices for improving and developing inter-provincial linkages to improve local connectivity. Now that the initial euphoria of ‘higher than the Himalayas and deeper than the deepest sea’ is over, the $45bn China-Pakistan Economic Corridor is beginning to hit the ground realities. As is expected of such a major initiative, some teething problems are coming to light, requiring a lot of legal and procedural clarifications and adjustments. Most of these seem to be exposing the general lack of preparedness and casual handling of projects that has be­come the hallmark of our bureaucratic culture. This has resulted in repeated project delays, cost overruns and unquantifiable lost economic opportunities. Cost rationalisation, according to Planning Minister Ahsan Iqbal, had alone created a Rs490bn cushion in the last fiscal year. While dealing with external players, such lethargy and poor project handling can have exponential costs. Pakistan has been paying substantial commitment charges without utilising loans from development lenders every year and this has to be taken care of on an urgent basis. Following the 6,600MW Gadani Power Park debacle arising out of a half-baked plan, the two sides seem to have learnt the lesson to take up ‘early harvest’ projects that are ready to take off immediately and could be expected to deliver results before the PML-N goes into the next polls with a success story on having reduced the power shortfall. Focal persons are now being appointed in all the ministries and agencies concerned with the CPEC to expeditiously process any hitches and glitches. Meanwhile, a mega coal-based project previously being pushed for Sahiwal is reported to have faced financing problems because of the infrastructure requi­red for transporting coal. It has now been replaced, at least on paper, with two sma­ller coal power projects at Thar and Hub to compensate for Sahiwal’s lost capacity. Pakistan has recently been struggling to convince Chinese authorities to acc­ept around a 10pc cost overrun for the $1.5bn Lahore Orange Line Metro Train even though the project has yet to take off. The Chinese Exim Bank was insisting on a loan agreement of $1.48bn to be signed with the Punjab government as originally discussed, but Pakistani authorities want this to be increased by another $147m to meet contingencies that arise during the project’s implementation. The local authorities have to be blamed for originally negotiating the project for $1.48bn with the Chinese before getting the cost escalated to $1.63bn through the Executive Committee of the National Council. Unless an arrangement for the ‘additional requirement’ is made, the project cannot achieve financial close. The financing cost of the 27km Rs165.2bn project is also reported to be on the higher side despite it being in the ‘concessional category’. On top of these, the Chinese have sought tax exemptions on insurance and financing on almost all CPEC projects. At the heart of the problem is the IMF’s condition under which the government has withdrawn the powers of the taxation authorities to grant exemptions through statutory regulatory orders. At present, no tax exemption is permissible on insurance premiums paid to non-resident companies because only a low rate of 5pc is applicable, while all CPEC projects are mostly covered by the state-owned Chinese firm Sinosure. The Chinese authorities want the insurance premiums paid to Sinosure to be exempted from the income tax. On a visit to Pakistan in April, President Xi announced $46bn in investments and credit lines in a planned China-Pakistan economic corridor. Earlier this year, one of China’s largest construction companies signed construction deals in Africa worth a combined $5.5bn. Both are OBOR projects, providing a platform for the cash-rich Chinese to invest, as well as the opportunity to lift growth across the world. As these countries benefit economically from the infrastructure investment, Britain should be poised to take advantage. The British government has already indicated its support for the Asia Infrastructure Investment Bank. British banks like Standard Chartered, which has had a continuous presence in China since 1858, are well placed to assist with the financing of OBOR. It is not only financial services, but a range of British business that should invest in OBOR, harnessing our expertise in PPP, engineering and supply chains. For example, last week’s agreement signed by Standard Chartered and other banks with the London Metals Exchange reflects the increasing demand for commodities from OBOR projects. The opportunities to invest in and support these infrastructure projects will be exciting. We should endeavour to ensure British business is welcomed in these markets, ready to support them and trade with them as they establish themselves in the new world order. British luxury brand Burberry, for example, has been investing across south-east Asia, most recently opening a new store in Bangkok. It’s a long-term investment, just as China is investing in OBOR for long-term prosperity. Federal Minister for Planning and Development, Prof. Ahsan Iqbal on Thursday said social and economic activities have started in Balochistan along with the roads being constructed there as part of China Pakistan Economic Corridor (CPEC). Under CPEC, two international standard roads are being constructed-- from Gwadar to Quetta, and from Gwadar to Khuzdar to Ratodero, he said.
" I was pleased to see, the local people have started setting up hotels, shops and houses along the completed portions of the CPEC routes linking Gwadar with China. This corridor shall bring social and economic change in Balochistan," he expressed his satisfaction while addressing a seminar on CPEC here. The seminar titled " China Pakistan Economic Corridor: A Road to Peace and Prosperity of the Region" was organised by an NGO , Rabita Forum International (RFI) and presided over by its Chairman RFI, Nusrat Mirza. It was attended by a large number of students from different universities and the teachers. RFI Chairman , Nusrat Mirza said the seminar was organised to create awareness among the students about the importance and prospects of CPEC, and what the role they could play in transforming CPEC into a big success for the country. The universities would have to prepare groups of professionals to meet the demands of the projects/activities emerging during and after execution of this very important international plan of CPEC, Nusrat Mirza said. The Federal Minister for Planning and Development assured that CPEC would be equally beneficial for all the provinces. Like Gwadar, he continued, Gilgit-Baltistan would be gateway to CPEC. 46 billion dollars CPEC would prove a game changer for entire region. It would interlink South Asia, Central Asia and Europe , and open billions of dollars market for Pakistan and other regional countries, he said. He elaborated that CPEC plan is divided into four parts : 1) setting up the most modern port of Gwadar which would increase our trade manifold, 2) strengthening of energy sector by adding more than 10,400 MW to the system and upgradation of the transmission system, 3) development of infrastructure based on three routes linking China with all the provinces of Pakistan, 4) industrialization mainly in Gwadar under Pak-China partnership and cooperation. Beijing also wants to reach Central Asia through the CPEC. 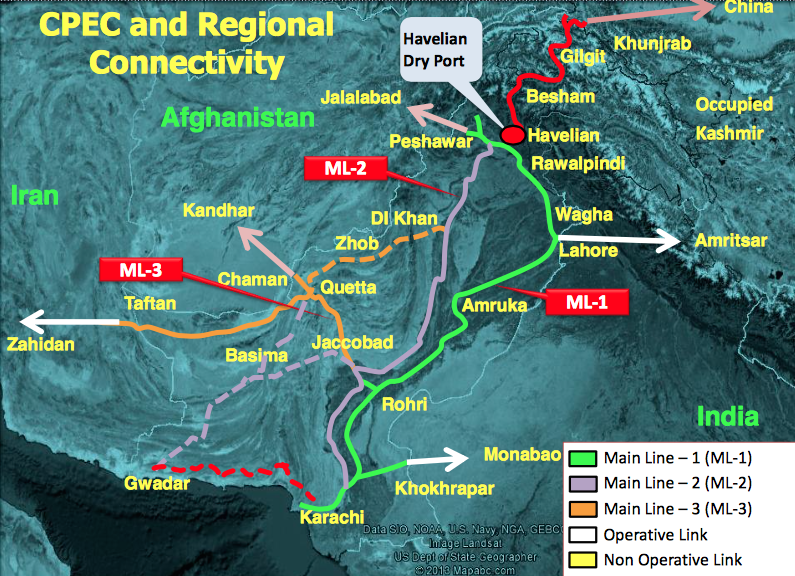 As Afghanistan is not willing, China and Pakistan are working on an alternative route – the Quadrilateral Agreement on Traffic in Transit. This route will deprive Afghanistan of an opportunity to cash in on the benefits that will emerge from the CPEC. Before the agreement on the $46-billion CPEC, Pakistan gave control of Gwadar Port to a Chinese company for developing and running the facility. China also plans to establish an oil refinery at the port. Tajikistan, which is seeking oil imports from Kuwait via Pakistan, has been offered access to the port. Tajikistan may also have the facility to bring goods from Middle Eastern states and other countries. Tajikistan is the only country among Central Asian states which is keen to give road and energy access to Pakistan. This can make Pakistan a trade hub as it will provide access to other Central Asian nations as well. In such a scenario, Balochistan will win a substantial share in economic development and will be able to stave off negative consequences of the insurgency. Economic prosperity will overcome the threat of terrorism and ensure stability in the entire country. Excerpts of "China-Pakistan Economic Corridor: Towards a New ‘Heartland’?" In order to comprehend China’s recent efforts to bolster its relations with Pakistan, one must first understand the intricate interplay between the geopolitical and geoeconomic implications of closer ties between the two Asian nations, as exemplified by the gargantuan CPEC project. Close relations between the two countries are nothing new. However, what has qualitatively enhanced the relationship is the changing geopolitical context. With the drawdown of Western – and particularly, the United States’ – presence in Afghanistan, China seized the opportunity presented by the power vacuum to expand its regional sphere of influence and further its economic and strategic interests in Pakistan. The geostrategic significance of CPEC is heightened by earlier Sino-Pakistani agreements. Firstly, China has been granted 40-year operational control of the port of Gwadar on the Indian Ocean, strategically positioned close to the Strait of Hormuz, at the mouth of the Persian Gulf. This will enable China to monitor its critical sea lines of communication, as 60 per cent of its crude oil imports pass through West Asia. Once CPEC is completed and the port is fully operational, China will be able to ensure that a large share of its oil needs are secured via Gwadar, saving time and billions in costs. More importantly, the new route would circumvent the potentially vulnerable Strait of Malacca. This is all the more significant given the United States’ growing presence in the South China Sea, where it is seeking to expand its influence as part of its pivot to Asia. Thus, bypassing the Strait of Malacca would present China with the option to avoid potential confrontation with the US and diminish the strategic value of the United States’ navy – all while monitoring US naval activities 460 kilometers west of Karachi and still keeping a safe distance from Indian navy bases. Significantly, while Gwadar is being developed as a commercial port for civilian use, it could potentially be transformed into a military facility for China’s navy. Another factor of relevance is Pakistan’s pledge to purchase eight Chinese diesel-powered attack submarines, in what analysts have referred to as China’s largest defence deal to date. In addition to entrenching China’s role as Pakistan’s foremost arms provider, the submarine fleet could potentially counter Indian attempts to blockade Pakistani ports on the Indian Ocean. Despite CPEC’s significant strategic implications for the country, India is yet to comprehensively articulate its stance vis-à-vis the economic corridor. CPEC is projected to cross Gilgit-Baltistan, part of the disputed territory of Kashmir, causing significant concern to India. Similarly, the prospect that Gwadar may one day become a Chinese naval base troubles New Delhi. Despite the fact that CPEC heightens the threat that the Sino-Pakistani partnership poses to India’s regional standing, there are signs of growing Sino-Indian economic interdependence. For instance, this is testified by a steady increase in bilateral trade, as well as China’s pledge to invest almost $20 billion USD in Indian infrastructure development projects. Indeed, CPEC is set to bolster economic relations in the region, potentially benefiting Indian trade and development as well. What is certain is that India cannot sit on the fence much longer, and ought to formulate a clear position regarding CPEC. The M8 is being constructed by Pakistan's National Highway Authority. Construction of the M8 commenced on 15 October 2004. According to a newspaper report of July 23, 2015 the construction arm of Pakistan army, Frontier Works Organization (FWO) has completed 502 of 870 kilometer of this road. The work started simultaneously from the junction with the Mekran Coastal Highway (MCH) and from Ratodero in Sind. As of January 2015 the road is completed except for some bridges from MCH to a point near Hoshab where it joins N85 (Hoshab-Panjgur-Besima Highway) and Hoshab-Bela Road. The M8 Motorway will be following the alignment of N85 but no noticeable construction has been completed on this section. From the Ratodero end M8 to Khuzdar is almost complete except for a difficult section going over the peaks of northern Kirthar range about seventy Kilometers east of Khuzdar. ZOHB (Dunya News) – Prime Minister (PM) Nawaz Sharif on Wednesday has said that the government would spend Rs 200 billion for construction of roads in Balochistan. The Prime Minister addressed a gathering at the foundation stone laying cereomy of the western route of the Chine-Pakistan Economic Corridor (CPEC). The premier said that Pakistan’s progress would begin from Balochistan. PM Nawaz said that Gwadar-Karachi coastal highway would be made a state-of-the-art motorway. He thanked the political parties for support of the CPEC. The PM said that several projects would complete by end of 2017. A 243 Kilometre (Km) long road would be completed by April 2016 while the funding would be drawn from the development package, he added. The Prime Minister said that around Rs 150 billion to Rs 200 billion would be spent in the coming three to four years on construction of roads. Feasibility reports of projects in Mach, Kharan and other areas are being prepared to initiate construction as soon as possible, he added. Nawaz Sharif said that Gwadar port would be made one of the best ports in the coming years. The Prime Minister said that construction of Gwadar-Hoshab road would be completed in January 2016, he added. The Gwadar-Hoshab road is 194 Km long. PM Nawaz vowed to build trade routes to Afghanistan and beyond. ZHOB: Prime Minister Nawaz Sharif Wednesday said a hefty amount of Rs.150 billion to Rs.200 billion would be spent in the next three to four years in Balochistan for alleviating its backwardness. The PM also announced his plan to build Karachi-Gwadar motorway while addressing a ceremony after performing groundbreaking of upgradation of Zhob-Mughal Kot (N-50) and Qila Saifullah-Wagum (N-70) roads. The 81-kilometer N-50 project, a part of CPEC, to be completed at the cost of Rs 8.80 billion by 2018. The 126-kilometer N-70 project will cost Rs 7.50 billion and it would also be completed by 2018. He said there was no precedent in the history of Balochistan that construction work on massive roads network continued on such fast track basis. He said as part of China Pakistan Economic Corridor, 194 kms road from Gwadar to Khushab would be inaugurated next month whereas Khushab- Panjgur -Basima 454kms road be completed by December 2016 by the Frontier Works Organization (FWO). Khuzdar-Wanguhil-Shahdad Kot, 243kms road would also be completed by the next year, he announced, adding all these projects were being funded by the government of Pakistan out of its Public Sector Development Programmes (PSDP). He praised the Director General FWO Maj. Gen. Muhammad Afzal and NHA chairman Shahid Ashraf Tarrar for their hard work and commitment. The Prime Minister also referred to Kalat-Quetta-Chaman and Kharan phase-1 roads which would be completed in the next year while feasibility work on Zhob-Jandola road was being done. He said uplift of the province was the top priority of his government as it would benefit the entire country. "The project would open up opportunities of trade and business for the whole region and help in removing backwardness of the province. Soon, there will be dawn of prosperity of which Balochistan would be the major source of fast track progress, "he added. CPEC DEVELOPMENT : There is a great sense of insecurity being felt among the people of Baluchistan and KPK . For sure the RICH are going to become more RICHER , BUT the poor is not capable and resourceful to reap the fruits of CPEC. This genuine concern of the people needs to be addressed by the government. I have a suggestion to make , we need to study the model of middle east countries . There is no foreign company in middle east who can do business without the involvement of local sheikhs called SPONSOR. Also they have kept compulsory employment quota for locals. We need to study this model and must benefit the sons and daughters of Pakistan. This will address the issues being faced by the government in CPEC development. Abbas: "There is a great sense of insecurity being felt among the people of Baluchistan and KPK"
I think it's a symptom of deep distrust of the Sharif family which is controlling the CPEC decisions. Such distrust of the ruling family is seen in all ethnic groups, including Punjabis, because there is no transparency in the process. But I question the provincial politicians' motives in this controversy. Instead of fighting with federal government over Chinese money and FDI, why don't they strive and make a case to investors to attract foreign and domestic investments after the 18th amendment, just as the US states do? According to an official statement, it was decided that the location of industrial parks will be decided in consultation with the provinces, while allied facilities and infrastructure for the industrial parks will be set up by consultation between the federal and provincial governments. It was also agreed that working on the principle of "One Corridor, Multiple Passages", the western route will be completed by July 15, 2018. The meeting agreed to increase the yearly allocation of Rs 40 ..
Kashgar, where Shandong Ruyi Science & Technology Group has chosen to build a new textile mill, lies on China's western reaches, about 300km from the border with Pakistan. But the unforgiving desert environment does not detract from the place's appeal to Chairman Qiu Yafu. "From here, we will open a path to the vast markets of India, Pakistan and Central Asia," said Qiu, whose company owns Japanese apparel maker Renown. This is not the only Chinese company going west. Scisky, a maker of water-based paint that counts itself among Ikea's suppliers, moved its headquarters from the city of Hefei near coastal Shanghai to Lanzhou in inland Gansu Province in 2014. Lanzhou marked an important stop along the old Silk Road. The impetus for Chinese businesses' westward movement today comes partly from President Xi Jinping's vision of a new era of connectivity on the Eurasian landmass. The slogan for this -- "One Belt, One Road" -- was introduced in 2013. But the idea builds on existing links. A railway already runs from China to Europe through Kazakhstan, and highway stretches from Kashgar into Pakistan. The Chinese-led Asian Infrastructure Investment Bank, which holds its opening ceremony Saturday, could help boost economic growth along these corridors. Chinese companies see market share to be had there. Some are already satisfying infrastructure-related demand. Heavy equipment builder Zoomlion shipped 30-odd machines for road construction to Kyrgyzstan late last year. Domestic rival Sany Heavy Industry is hurrying to position itself in Turkey, India and other places where huge earthmoving projects are underway or in the works. Countries along the new Silk Road hold the promise of market growth. Tajikistan's population of 8.48 million is projected by the United Nations to swell to 14 million in 2050, while that of hydrocarbon-rich Kazakhstan, home to a burgeoning middle class, is seen rising 30%. Gansu Province-based Lanzhou Lanshi Group, a maker of oil production and refining equipment, plans to open sales offices in India, Turkmenistan and four other countries by the first half. It aims to raise the proportion of foreign revenue from less than a tenth to more than half. "New domestic orders have taken a blow from falling crude oil prices," sales manager Yang Gang said. "We're responding by prospecting in foreign markets." China's trade with Pakistan and four other neighbors to the west surged in the past decade, topping $50 billion in 2013 -- about 15% the size of its trade with Japan. Although 2014 brought a decline as commodity prices slumped, westward trade will likely rebound as connectivity projects move from the drawing board to reality. This will mean more opportunities for payment in yuan. Beijing aims to create an expansive commercial sphere where the redback, and not the greenback, serves as the principal currency. The AIIB fits into its strategy of undermining the U.S.-centered, dollar-dominated global financial order that arose after World War II. The power of the yuan is growing visibly in the region. Soon after China devalued the currency by 2% last August, Kazakhstan allowed the tenge to float, in effect responding with its own deep devaluation. Prime Minister Nawaz Sharif on Wednesday inaugurated the Gwadar-Hoshab (M-8) road and reviewed the work being carried out on the China-Pakistan Economic Corridor (CPEC). During the inspection of the newly constructed M-8 route, General Raheel Sharif personally drove the prime minister in an open-top vehicle. The military spokesperson also added that the locals were overjoyed with the progress of the CPEC project. “The land-locked Central Asian states are interested in trade via the Gwadar port,” said the prime minister. He said on the occasion that CPEC would open new vistas of development and prosperity in the region in general and benefit the country in particular. The inauguration ceremony of M8 was attended by Chief Minister Balochistan Nawab Sanaullah Zehri, Chief of Army Staff General Raheel Sharif, Commander Southern Command Lieutenant General Amir Riaz and other high ranking military and civilian officials. The prime minister on the occasion also praised the services and sacrifices rendered by the Frontier Works Organisation (FWO) in the construction of CPEC. “Despite security problems, work is in full-swing on construction of roads in Balochistan,” added Nawaz. The Prime Minister elaborated that after completion of CPEC and other related projects, Balochistan would not be dependent for financial aid on the federal government. "CPEC would ensure economic development of Balochistan", he said, adding that the people of the province would be major beneficiaries of the mega project. "Projects cannot be completed through mere slogans, rather a strategy was imperative for completion of projects", he said. The prime minister also reiterated his commitment on the occasion and said efforts were being made to develop Balochistan and bring it at par with other parts of the country. The CPEC will reduce China's routes of oil and gas imports from Africa and the Middle East by thousands of kilometers, making Gwadar a potentially vital link in China's supply chain. The inauguration ceremony of M8 was attended by Balochistan Chief Minister Nawab Sanaullah Zehri, General Raheel Sharif, Commander Southern Command Lt Gen Amir Riaz and other high ranking military and civilian officials. Prime Minister Nawaz elaborated that after completion of CPEC and other related projects, Balochistan would not be dependent for financial aid on the federal government. “CPEC would ensure economic development of Balochistan,” he said, adding that the people of the province would be major beneficiaries of the mega project. “Projects cannot be completed through mere slogans, rather a strategy was imperative for completion of projects,” he said. Meanwhile, Gen Raheel visited Hoshab area in Southern Balochistan to inspect new roads being built by army engineers as part of the China Pakistan Economic Corridor (CPEC). According to DG ISPR Lt Gen Asim Saleem Bajwa, Gen Raheel lauded the pace and quality of work done by the Frontier Works Organisation (FWO). In Pasni, the COAS held a meeting with Balochistan governor, chief minister and chief secretary. The total road being built by the FWO for CPEC is 870kms long, out of which, 632kms have been completed within the last one and a half years. Earlier in January, Prime Minister Nawaz Sharif had inaugurated the western route of the (CPEC) in Balochistan’s Zhob and laid the foundation stones of two key projects – upgradation of the Zhob-Mughal Kot section of the Dera Ismail Khan-Qila Saifullah Highway (N-50) and the Qilla Saifullah-Waigam Rud Road section of the Multan-Dera Ghazi Khan-Qilla Saifullah Highway (N-70). China has launched an unusual charm offensive to explain its first overseas naval base in Djibouti, seeking to assuage global concerns about military expansionism by portraying the move as Beijing's contribution to regional security and development. The message is in stark contrast to Beijing's more bellicose stance on the South China Sea, where its claims on a vital trade waterway have raised hackles across Asia and the United States. China has repeatedly said it does not seek a U.S.-style "hegemony" by extending its military reach, including through bases abroad. Now that it appears it may be doing precisely that, the government has been quietly briefing on its rationale for the Djibouti base and using state media to address fears of China's aims. "China is explaining it as part of the 'one road, one belt' strategy, to help link Ethiopia to the sea," said one Western diplomat who has been briefed by Chinese officials on the Djibouti base, referring to China's New Silk Road strategy. That involves opening trade corridors across continents that will help bolster the Chinese economy and connect it with the rest of the world. A $4 billion railway will connect Ethiopia's capital Addis Ababa to Djibouti's new Chinese-invested port, where a military facility will be located, according to Chinese media. A second diplomat, also been briefed by China on the plans, said it was an "unusual" move by the normally secretive Chinese government to try and bring a degree of transparency to its plans. In a lengthy statement to Reuters, China's Defence Ministry confirmed it had communicated its intentions about Djibouti to "relevant countries and international organizations", reiterating the facility was mostly for resupply purposes for anti-piracy, humanitarian and peacekeeping operations. "What needs to be stressed is that China upholds a path of peaceful development ... and has never engaged in an arms race or military expansion. This will never change." Djibouti, which already hosts military facilities for the United States and France, has echoed Beijing's line that the base will be used for refueling and other logistical support to fight piracy and protect trade routes. But it also says the West should not be worried if China seeks "military outposts", given that Western nations have had them for years around the world. Construction began in February in the country of fewer than a million people, striving to be an international shipping hub. Djibouti's location on the northwestern edge of the Indian Ocean has fueled worries in India that it will become another of China's "string of pearls" of military alliances and assets ringing India, including Bangladesh, Myanmar and Sri Lanka. Indian military officials told Reuters that China's naval presence in Djibouti would add another dimension to India's military contingency planning, so far confined to land and air operations stemming from a decades-old border dispute with China across the Himalayas. Together with China's involvement in Pakistan's Gwadar port, another potential military base, the role of China's navy would be greatly enhanced and posed a threat to the Indian navy, Indian army brigadier Mandip Singh said in a paper for the government-funded Institute for Defence Studies and Analyses. "Djibouti also enables China to base its long-range naval air assets there. And these are capable of maintaining surveillance over the Arabian Sea as well as India's island territories off the Western coast," he wrote. The Western diplomat briefed on the Chinese plans added: "If I were Indian I would be very worried about what China is up to in Djibouti." Western route again diverted from Southern KPK (Pezu, Lakki Marwat, Kark, Kohat to M1) to Punjab (Mianwali, Tala Kang and Halka. Now western route will just touch Dera Ismail Khan (mostly Saraiki Speaking) and then exit to Punjab. Legend say that Mulana Fazal Rahman and CM Pervez Khatak have been duped by throwing approving projects for DI Khan and Central KPK (Nowshehra, Mardan, Malakand), which will executed by their favorite contractors. There is a haste in approval of part cases and immediate fund release in Planning Commission. It is despite the fact that Southern KPK has been hit most by terrorism and military operations during past 15 years. While all US blood $ were consumed in thin air through unsustainable projects in Peshawar, Lahore, Islamabad and Pindi. Will billions $ projects like Green / Orange Metros and CPEC increase or decrease deprivation of oppressed masses in Waziristan and Baluachistan in long term ? Will Nawazite successful in keeping everything related to mega projects secret ? Will CPEC be another Kala Bagh by keeping every thing under close secrecy in long term ? Are these fancy projects sustainable in long term ? In a ranking of the top 45 economies in the world, Pakistanis came last in the Future Orientation Index (FOI, The Guardian 2013). China will provide 90 percent of the financial assistance for the 393-kilometre Sukkur-Multan Motorway, whereas remaining cost of the project will come from the Public Sector Development Programme (PSDP). An official of the National Highway Authority Thursday said that physical work on the Sukkur-Multan Motorway costing Rs 294 billion had been started. It is also a part of eastern route under the China-Pakistan Economic Corridor (CPEC), which will be completed within three years costing Rs 294 billion, the official said. This motorway passing through Multan-Jalalpur Peerwala Ahmedpur East, Ubaro, Panno Aqil will terminate at Sukkur. Total 54 bridges will be constructed, including one major bridge on Sutlej, he added. The official further said Karachi-Hyderabad Motorway (M-9), which connects Karachi to Hyderabad, is going to be 136-kilometre long with 16 exits and is going to cost about Rs 24 billion. He said the M-9 would later be linked to the Karachi-Lahore and Karachi-Gwadar motorways to constitute the longest tract in the motorway network. The National Highway Authority (NHA), the official said, is taking all possible measures to ensure the timely completion of the China-Pakistan Economic Corridor (CPEC). "The CPEC project comprises modern highway and railway transportation system linking Kashgar in West China to Khunjerab in the north and onwards to Karachi and Gwadar in the south of Pakistan through multiple routes," he added. He said that a number of sections of this mega project had been completed and remaining sections were under construction. He said that the 784-kilometer segment from Khunjerab to Burhan consists of Karakoram Highway (KKH), out of which 335 kilometre from Khunjerab to Raikot had already been upgraded. The official said that the remaining part from Raikot to Islamabad was divided into three sub sections of Raikot-Thakot, Thakot-Havelian and Havelian-Burhan. He said the construction work on 120-kilometre Thakot-Havelian section of the road has started after its ground breaking by Prime Minister Nawaz Sharif recently. He said that the work on 59-kilometre Burhan-Havelian section also known as Hazara Motorway was going smoothly and it would be completed by end of 2017 at a cost of Rs 34 billion. The official said that work on 288km section of the western corridor from Burhan to Dera Ismail Khan would start within weeks. He said the project had been divided into five smaller sections so that work could be completed according to the given time frame. He said that Rs 13 billion PC-1 for acquiring the land required for the project had been approved. The project envisages construction of 285km four-lane expressway from Hakla on M-1 to DI Khan near Yarik on N-55 as part of western route of the CPEC, he said. The China Pakistan Economic Corridor (CPEC), a railroad which will traverse western China through Pakistan, will help job creation as well as help to curb terrorism as people grow more prosperous, Pakistan's former prime minister told CNBC on Wednesday. The $46B deal agreed upon between China and Pakistan will allow China to avoid its current maritime sea routes to bring products into the Middle East and Europe. It will develop connectivity and create economic activity in Pakistan, former Pakistani Prime Minister Shaukat Aziz said. "When you build a road or a highway through an area where there is none, you create economic activity, you create jobs, secondly new cities come up along that route , thirdly you have industrial estates coming so a lot of job creation takes place," said Aziz. Despite a warning from the Pentagon that China is looking to set up a naval base in the country, the Pakistani army chief visited Beijing earlier this week to further discuss the project and the Pakistani army's involvement. The Pakistani army will provide 15,000 special security forces to protect the investment in Pakistan, which has suffered greatly over the years due to security and terrorism issue. "Whenever you have empty bellies, people get more vulnerable and subject to extreme behavior. If you create economic activity and give them a reason to live, if you give them a better tomorrow than yesterday, people tend to be more peaceful," said Aziz. "We have seen over the years that in areas that have grown fast and where economic growth is strong, extremism and terrorism reduces," Aziz told CNBC. "This is a serious initiative and we will do all what it takes to provide security and leverage this linkage between the warm waters of the Arabian sea all the way up to China." As per the contracts, China would provide a concessionary loan of $1.3 billion for the 120-kilometre long Thakot-Havelian section of Karakoram Highyway-II (KKH-II) and $2.9 billion for the 392-kilometre Multan-Sukkur section of the Lahore-Karachi motorway. Since China is providing concessionary loans for both projects, the contracts have been awarded on a government-to-government basis, waiving the condition of international competitive bidding. Out of the $46 billion CPEC investment package, roughly $11.5 billion is reserved for the road and railways infrastructure. China has promised to give concessionary loans for four infrastructure projects. Two of these projects will get interest-free loans. China would extend assistance to Pakistan at 1.6 percent interest rate for infrastructure projects under the China-Pakistan Economic Corridor (CPEC), it is learnt. Member, Infrastructure and Regional Connectivity of Planning Commission Malik Ahmad Khan confirmed that China would extend assistance to Pakistan at 1.6 percent interest for infrastructure projects under CPEC. "We wanted China to reduce this rate from 1.6 percent to 1 percent. And the Finance Division is making efforts in this regard," he added. Under the China-Pakistan Economic Corridor Projects (CPEC), China has promised to invest around $11.8 billion in infrastructure projects and $33.8 billion in various energy projects which will be completed by 2017 at the latest. According to sources, the corridor is a 2,700-kilometre highway that would stretch from Kashghar to Gwadar through Khunjrab. The CPEC will integrate the economies of the two friendly countries; it envisages several economic zones. Does China see CPEC absorbing excess industrial capacity? The CPEC provides an additional incentive for Chinese companies to extend further afield and expand their business models. Then there is the utilisation of its excess industrial capacity, which China stands to gain from considerably; “Putting idle machinery to use in another country helps to alleviate the domestic burden of idle productive capacity”, Polk explains, “which is currently one of the major constraints on China’s growth, so removing that excess capacity by building infrastructure in other countries may help to accelerate a stabilisation in China’s industrial sector”. Given such advantages for China, it would seem that the benefactor is gaining from the project as much as the recipient, and some may argue, even more so. Work on the projects of western route of Pakistan China Economic Corridor (CPEC) is continuing rapidly and will be completed by December 2016, official sources said. CPEC will benefit all the provinces especially Balochistan, Khyber Pakhtunkhwa and Federally Administered Tribal Areas (FATA). According to data released by Planning Commission of Pakistan, 335 km long Khunjerab to Raikot road is complete while the feasibility study of 270 km Raikot to Thakot road is complete. Work is continuing on Burhan-Havelian expressway, 280km long Burhan-Dera Ismail Khan road, 124km DI Khan-Mughalkot road, 81 km Zhob-Mughalkot road, 454km Khushab-Saryab road and 193 km Khushab-Gwadar road. The federal government has given considerable importance to the project and made substantial allocations for it in this year’s financial budget. CPEC project includes new power stations and special industrial zones to spur regional trade. Chinese Deputy Ambassador, Zhao Lijian said on Wednesday that world largest construction company was implementing Sukkur-Multan section of Karachi-Lahore motorway project creating more than 10,000 jobs for local people of Punjab and Sindh provinces. Giving details of energy projects being completed in year 2017, he said, 70 percent work on Sahiwal Coal Power Project had been completed and its first unit would start producing electricity by end of June next year. Chief of Army Staff (COAS) General Raheel Sharif has on Monday said that building 1000 kilometer long China-Pakistan Economic Corridor (CPEC) was an honour for Frontier Works Organisation (FWO). He said that FWO had become a strategic organisation after years of hard work, reported Dunya News. According to Inter-Services Public Relations (ISPR) department, General Raheel Sharif attended FWO’s Golden Jubilee ceremony, where he praised FWO for its extensive construction experience and completion of massive projects. Army chief said that FWO had completed projects like Karakoram Highway, Central Corridor linking Afghanistan with Waziristan, Coastal Highway and several hydel projects. He congratulated FWO over the completion of such extraordinary projects. 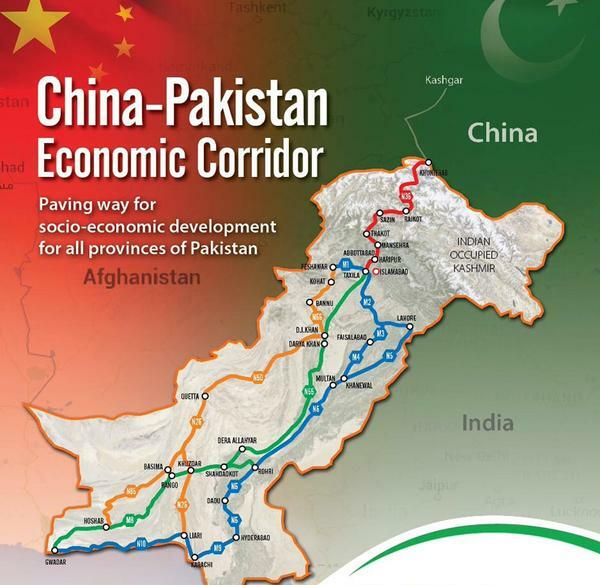 Western Route of China-Pakistan Economic will be completed by 2018. Gawadar-Quetta Road will be completed by next month, ahead of its scheduled time. Now Gwadar is connected with Quetta, Afghanistan, Central Asian states and rest of the country through this route. Work on Dera Ismail Khan-Quetta Road has also been initiated. Dera Ismail Khan-Burhan Road will be completed by year 2018. Special attention has been given to Sindh and Balochistan in CPEC projects. In the modern concept of infrastructure development, Public Private Partnership (PPP) has attained importance and popularity. Build-Operate-Transfer (BOT), is a project financing and operating model or structure and is a form of PPP wherein a private entity receives a concession from the private or public sector to finance, design, construct, and operate a facility stated in the concession contract which varies from 20 to 30 years. The facility may be a power plant, airport, toll road, tunnel, water treatment plant or any other public utility project. The concession period is determined primarily by the length of time needed for the facility's revenue stream to pay off the company's debt and provide a reasonable rate of return for its effort and risk. This enables the project proponent to recover its investment, and project operating and maintenance expenses. After completion of the concession period, ownership is transferred back to the granting entity which may be federal, provincial or local government or its department. This profit sharing principle is the key aspect differentiating the BOT approach from the outsourcing arrangements commonly undertaken in the country. BOT has found its application in recent years primarily in the area of infrastructure privatization especially in the developing countries. BOT utilizes the private sector financing to provide new sources of capital, which reduces public borrowing and direct spending, facilitating the governments to develop projects that would otherwise compete for scarce sovereign resources. In Pakistan, 95 percent of the total goods traffic and 90 percent of passenger traffic utilize roads, whereas only 5% goods and 8% passengers use Railway for their transportation. Only 2% passengers move by air. In view of such a situation, road network bears the maximum traffic load in the country. Total Asset of road infrastructure is about 45,940 Lane Kms. Its Routine Maintenance cost is calculated at Rs.5 Billion/annum, whereas it's Periodic Maintenance Cost is about Rs. 30 Billion/annum. Its current revenue collection however amounts to only about Rs. 15 Billion/annum whereas its Operational Cost is about Rs. 7 Billion/ annum. Thus there is a shortfall of Rs. 27 Billion/ annum. As evident, even maintenance of the existing infrastructure is not possible from within the revenues generated out of this infrastructure. To meet the ambitious goals of completing and maintaining the large motorway network in the country as planned by Government of Pakistan, Public-Private Partnership is, therefore an inescapable necessity. In view of the meager budgetary resources and revenue generation National Highway Authority has floated various BOT schemes in this context. Prime Minister Muhammad Nawaz Sharif, Wednesday (today) said that the development of Balochistan means a new Pakistan is in the making. “Building up of a new Balochistan means that a new Pakistan is being built,” the premier said while addressing a gathering in Turbat in connection with the inauguration of Sorab-Hoshab Highway N-85 on Wednesday. The 448 km long Sorab-Hoshab highway forms an important link on the western route of the China-Pakistan Economic Corridor (CPEC) and has been built at an estimated cost of Rs22 billion. “I have visited Balochistan the most number of times during my current tenure as prime minister and it has always been to inaugurate a project…this road will bring prosperity to the area,” Nawaz added. “Travelling from Quetta to Gwadar used to take two days but now with the help of this road one can leave Quetta at sunrise and reach Gwadar by noon,” the prime minister said. The prime minister said the road was proof that the government had brought progress back to the region. “This road will connect Balochistan to the National Highway, to the rest of the country and to Afghanistan. The people of Gilgit-Baltistan will also benefit from it,” the premier said. Criticising previous regimes, the prime minister said “those before us had this opportunity, but they wasted it…this work can only be done by someone with a vision. We have this vision…not only are we making roads…these roads are bringing children closer to schools and bringing employment and livelihood to the poor”. Meanwhile, in an apparent reference to Pakistan Tehreek-e-Insaf (PTI) chairman Imran Khan, Nawaz said some people think they can assume power by creating an uncertainty in the country. The nation is able to determine the ones working for the development of the country as well as those playing with their emotions, he remarked. Development, the premier reiterated, is the only way to take this country forward and the incumbent government has made it clear that the only way to rule is through service to the masses. The project contractor – Frontier Works Organization (FWO) has completed 16 Bridges,1502 Culverts at N-85. The project links Gwadar Port with National Highway network (N-25) near Surab/Quetta. The road would provide the shortest link to Afghanistan and other Central Asian countries with Gwadar Port. With the completion of this project, the vital North-South road connectivity has also been completed. The construction and land acquisition work on all portions of the Western Route of China Pakistan Economic Corridor is under way and the major work on the Route is expected to be completed by next year. The shortest of all CPEC routes is Western Alignment of the CPEC which is 2,463 km length and starts from Khunjrab, passing through Burhan (Hakla), DI Khan (Yarik), Zhob, Quetta,Surab and Hoshab and terminates at Gwadar. An official of Planning Commission told APP that the Western Routes’ 615 Kilometer Khunjrab Raikot section has already been completed while Havelian Abotabad Manshehra (40 km) section will be completed by May, 2018. He said work on construction of all five sections of Hakla D.I.Khan Expressway had begun. This project is an important part of Western Route of CPEC and the 285 km long Motorway will be completed in two years at a cost of more than Rs 142 billion. He said that the project alignment started at Hakla,near Tarnol interchange on M 1 and passes through Fateh Jhang,Mianwali,Kundal and ended at Yarak at Indus Highway (N 55). He said that the alignment of motorway passed through developing areas and its construction would generate new employment opportunities. Availability of high speed transportation will pave way for improvement of health and education sectors as well, and local produces will easily be taken to the big markets. He said that ground breaking of the up gradation of Zhob Mughalkot section was performed by Prime Minister Nawaz Sharif in December 2015. He said that rehabilitation of D.I.Khan Mughalkot section of N 50 would be completed by 2018. Moreover he said that dualization of 531 km D.I.Khan to Kuchlak section of N 50 would be operational by 2020. The objective of the CPEC was to promote trade ties with neighboring countries Central Asian States and South Asian countries, which would ultimately make Pakistan a trade hub in this whole region, he said. Similarly, the Sorab Hoshab highway forms an important link on the western route of the China Pakistan Economic Corridor (CPEC) and has been completed at an estimated cost of Rs 22 billion. The highway is 449 kilometers long and links the Gwadar port to the north. The official said that with the completion of the highway, the distance time from Gwadar to Quetta had been reduced from 48 hours to only 10 hours. The western route of the China-Pakistan Economic Corridor (CPEC) is going to be completed by the end of this year along with other 11 mega projects which were initiated in 2015-16. “The first year was difficult,” says one of the officers I’m driving with. “IED [improvised explosive device] attacks were common, rocket fire was regular. It was quite difficult working here initially.” Almost 40 people were killed in that first year, half army and half civilian, and another 350 were injured, some seriously. Acting Ambassador of the People’s Republic of China, Zhao Lijan Friday said that under the China Pakistan Economic Corridor (CPEC), western route of the project would be completed earlier than the eastern route. Speaking at the National Press Club here about CPEC Project, the Chinese envoy dispelled rumors about the Western Route and said that western route of CPEC would be completed earlier than the eastern route. He said work on various project under the CPEC was going with full speed and 22 projects would be completed during the current year while 18 projects would be completed next year. He said that China desired improvement in Pak-India relations and both Pakistan and India could resolve their issues with peaceful dialogue. According to the latest progress report on CPEC issued by the Chinese Embassy in Pakistan, 20 more projects were in pipeline under CPEC, which was the largest and most comprehensive project under the Belt and Road Initiative (BRI), besides being of great political, economic and social significance to China and Pakistan. For implementation of CPEC, the two sides have set up a ministerial-level Joint Cooperation Committee on CPEC Long Term Planning (JCC) and seven joint working groups on planning, energy, transportation infrastructure, Gwadar Port, industrial cooperation, social economic development and international cooperation. They also decided to establish Joint Working Groups on social economic development and international cooperation. Out of 15 energy projects planned as priority with a total generation capacity of 11,110MW, seven have been completed and in operation, while another six are under construction with a total capacity of 6,910 MW. At present, Zonergy 300MW Solar Park, 50MW Dawood Wind Farm, Jhimpir UEP wind power project, Sachal 50MW Wind Farm, Sahiwal 2×660MW Coal-fired Power Plant, Port Qasim 2×660MW Coal-fired Power Plant and Three Gorges Second and Third Wind Power Projects have been completed. These projects have added 3240 MW to the Pakistani national grid, amounting to more than 11% of the total installed capacity of 29,000 MW in the country. CPEC energy projects are providing affordable energy to Pakistani consumers in a diversified way. The tariff of power plants has been sharply decreased from Rs 16-18 to around Rs 8 per unit. With the introduction of CPEC energy projects, Pakistan also reduced its heavy dependence on gas and LNG power plants, which account for 50% of total installed capacity. 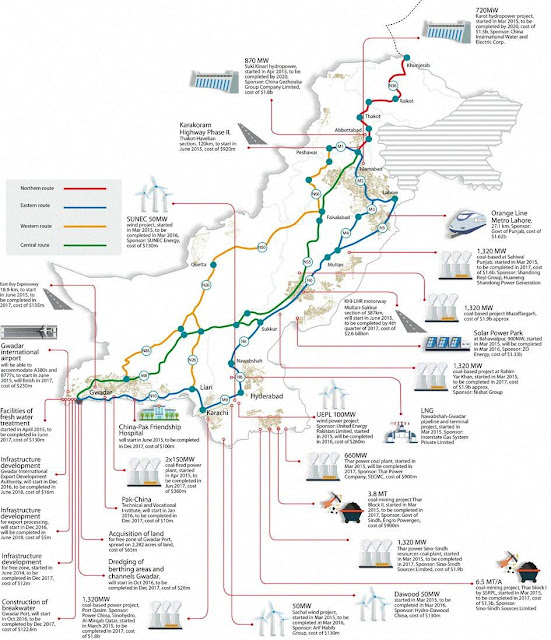 The CPEC energy projects are foreign direct investment and are executed in accordance with BO(O)T mode. Any debt arising from the CPEC energy projects would be borne by the Chinese investors instead of the Pakistani government. Regarding infrastructure projects, the report said currently, three projects including KKH Phase-II (Havelian-Thakot section), Karachi-Lahore Motorway (Sukkur-Multan section) and Lahore Orange Line are under construction. The information highway for laying of an optical fiber cable (OFC) from Rawapindi to Khunjrab is in operation. These ongoing projects are funded by preferential loans from the Chinese government at around 2% interest rate with a total amount of 5.874 billion USD. The up-gradation of ML1 railway and the KCR are under discussion. About Gwadar Port, it said up to now China Overseas Ports Holding Company (COPHC) has invested $ 250 million in the port renovation. Five new quay cranes, a 100,000 M2 storage yard, a seawater desalination plant with capacity of 220,000-gallon pure water/day, two sets of sewage disposal systems and cargo handling equipment have been installed and 80,000 M2 green space has been added to the port area. 400,000 tons of cargoes have been handled by Gwadar Port in 2017. 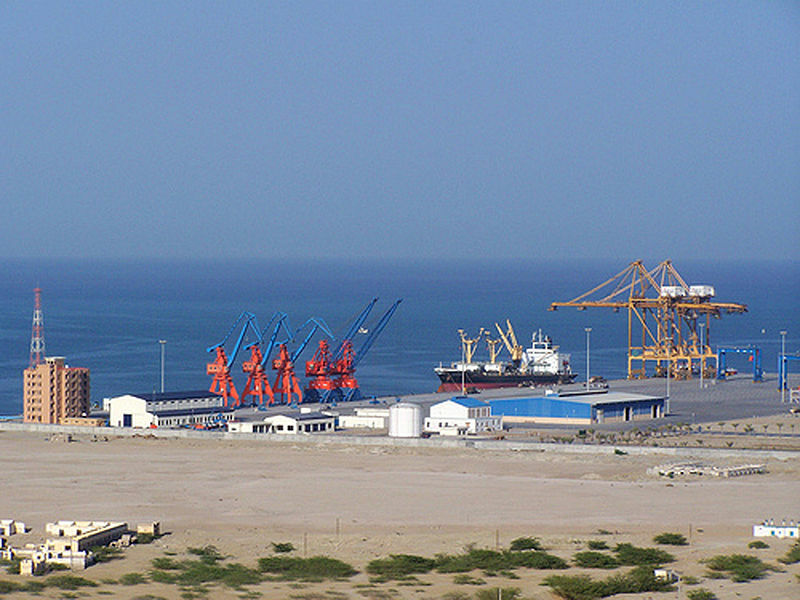 The Gwadar Free Zone is located in the northern part of Gwadar. The planned development period is from 2015 to 2030, and is divided into four phases. The 923-hectare Free Zone includes an initial area (25 hectares) and the northern area (898 hectares).